This thread is really moo-ving along. Love the egg's, mind you they are close to being seriously eye watering in scale, but cracking for game purposes. inmygravenimage wrote: Ha. Quality. DOOM CHICKEN! Finger lickin good , eeeeewwwww no . You should know better that puns are more than eggcepted here . Briancj wrote: This thread is really moo-ving along. Camkierhi wrote: Love the egg's, mind you they are close to being seriously eye watering in scale, but cracking for game purposes. Are they eye watering in a good way? I think they are comically large now, but I didn’t have the model with me and for a couple bucks it wasn’t a bad investment. Well, the last week has been stupid. Good coworker got canned for something stupid, rightly so, but still compared to all the other we put up with why they chose to do him that way is beyond me. One of two (out of 50+ people in our department) that I could carry on a conversation with, learn something, and actually enjoy a laugh. It’s made work this week really difficult and unwinding at home harder. Anyway, stopped by Miniaturemarket today . 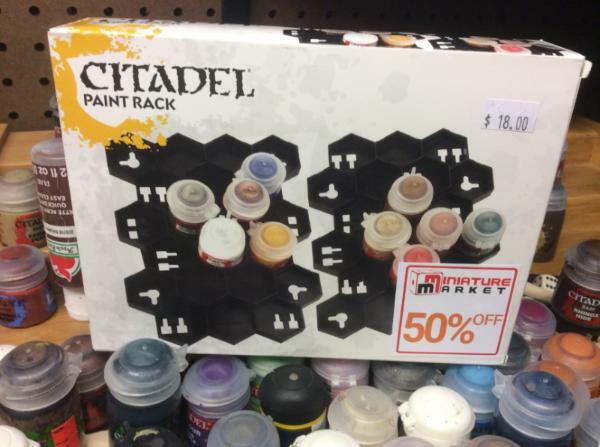 New GW paint racks, box damage made them half off.....okay. 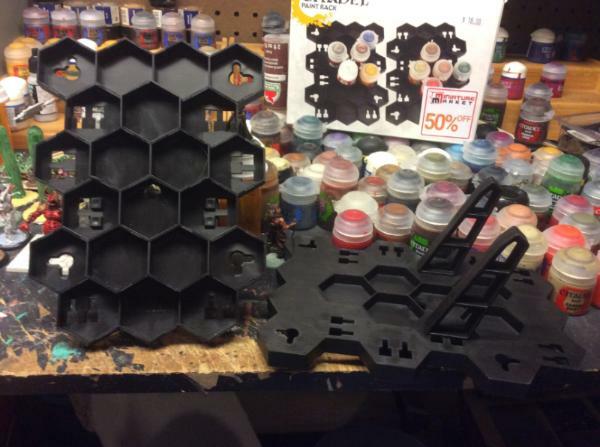 I’m thinking of redoing my paint table again, and these looked interesting. They can be stood upright,laid flat or mounted to a wall. 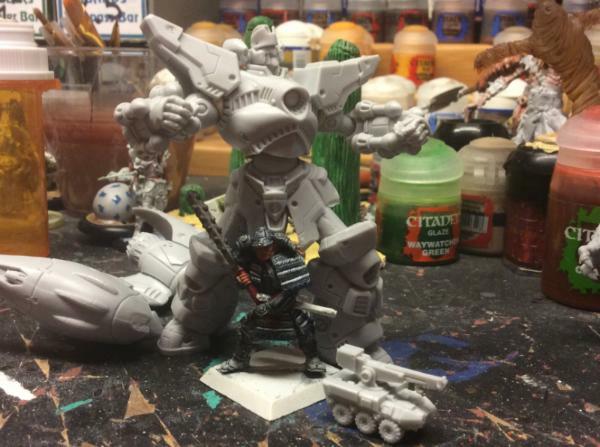 I plan on wal mounting mine eventually, which means the little legs can be used for conversions. Each of the plates holds 21 paint pots, including the taller wash pots. They are held tightly so no chance of them falling out when hung flat to the wall. Also in my quest to refill my paint range I grabbed this which was also half off since the glue bottle popped inside, it got a little on the cutter, but not enough to make it not work. So $20 for 13 paints, a GW cutter and a brush . So I got a better deal on GW stuff after their sale ended than when it was running. I didn’t realize how much detail this guy had and is a pretty nice sculpt. I may have to look back in on my Mantic stuff again . That's a pretty good price for Citadel paints. 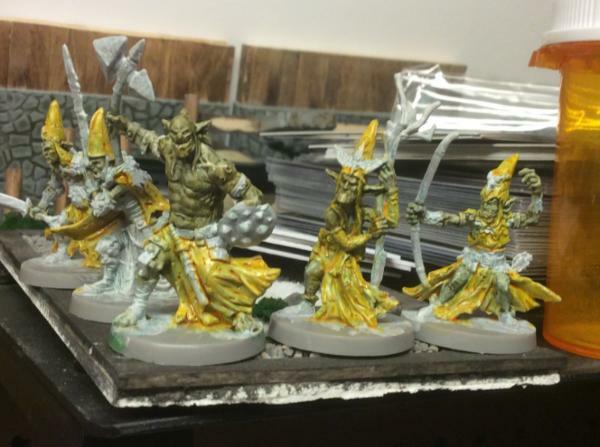 I went all in on the Dungeon Saga KS, and have been generally pleased with pretty much all of the models. I wish there were more than one pose for each, though. Mantic metals are ace. Their plastics, not so much good haul though nice score. Nice haul Theo, there are always rumblings about GW paints, but they are good, I have tried a few others and they are all good. But I have GW paints that are 20 years old and still going strong, I think that will take some beating. I am really interested in Dungeon Saga, keeps catching my eye, just not quite enough to bite the bullet yet. 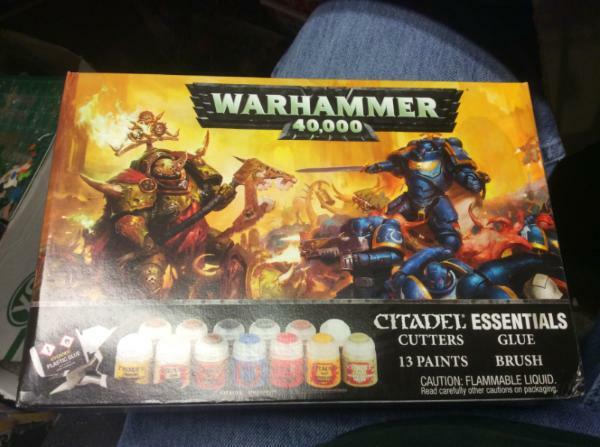 JoshInJapan wrote: That's a pretty good price for Citadel paints. I didn’t go all in, just got the core I believe, I thought the dragon was derpy and my money went to another KS at the time so just got the basic pledge. inmygravenimage wrote: Mantic metals are ace. Their plastics, not so much good haul though nice score. I only have a few of their metals, one being an old dwarf lord, I have a slew of their plastic orcs though. So much so that I have backed away because building them was a hassle. Camkierhi wrote: Nice haul Theo, there are always rumblings about GW paints, but they are good, I have tried a few others and they are all good. But I have GW paints that are 20 years old and still going strong, I think that will take some beating. Same here with the age of GW paints, I have a ton of old ones and at one point I pitched 40-50 pots of the twist cap bottles as I didn’t know I could just add flow aid . The best part is every game store carries them so you can always find the one you need.....even if the name has changed again . As I said above I had gotten the basic DS pledge, so no expansions, but back in the day Miniaturemarket carried Mantic stuff and I grabbed 3 more DS starter boxes that had cover damage to the slip cases for half price. Gave one to my brother in law, still have the other two sets, so I could make a large dungeon floor if desired. In essence though I just have three boxes of plastic man things. I got more time in on the infernal last night, but made it an early night and almost got 8 hours of sleep. WTF is that about??? Never mind the Diarrhea colored base , was going to try something, but it was not doing what I wanted. Maybe when I look at it later it will have changed , you know when you paint something and then come back later and your like . Sometimes it comes out for the better. All this Mantic talk almost has me wanting to paint some orcs...... I must resist. 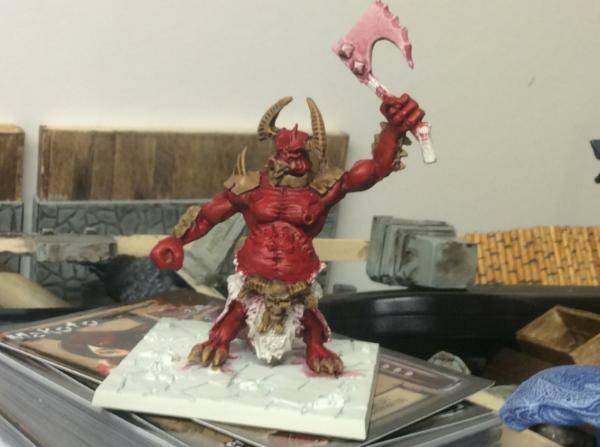 Still have my Mantic hatred since they called some of us backers liars when our KOW2 kickstarters were mishandled and lost, and our Blaine figs came months later because of the computer goof up and not ordering enough through their supplier . Can I still hate them? Or has it been long enough and I should root for them again since they are the underdogs again? I guess my painting whims will decide for me. There's a lot of good, new people at mantic. Time heals all wounds. That and Superglue. Im sure there is, it was just a huge kick in the teeth when they said that, then a few days later it was “There’s computer problems and we missed a lot of stuff.” No apologies were given. Anyway, grabbed another couple models out of the Dungeon Saga dungeon. Tried a little something different with this orc guy. 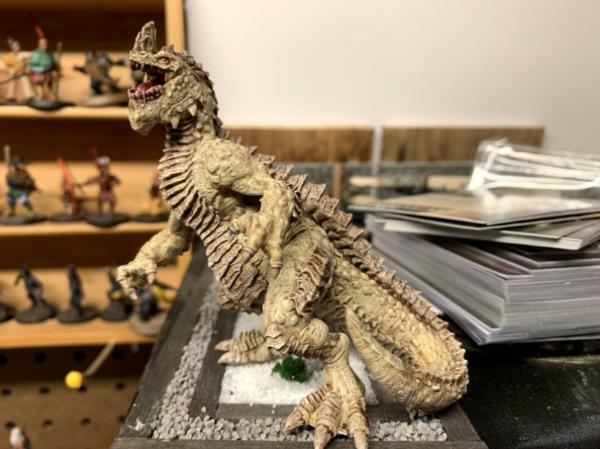 He had been primed white over his green plastic (some green still showing in the recesses, and all I used on him were washes. Still needs more layers of washes in different spots, but I really like the look so far. Areas may need 3-4 applications to get the coverage, but the tones are better than I could do with regular painting. Theophony wrote: There's a lot of good, new people at mantic. Time heals all wounds. That and Superglue. It's ok. I still don't talk to Wyrd or PP for much the same sort of thing. I like the colour you've got going on there mate, too. 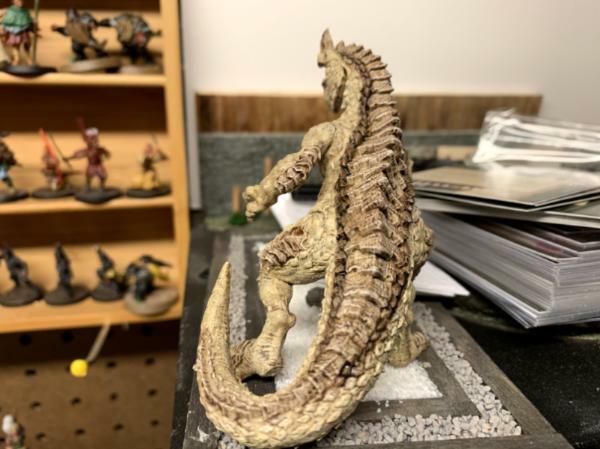 Hmmm...I am only very tangentially aware of Mantic's models. That orc looks pretty cool. Technique seems to be working out, too. Is that Infernal a metal or plastic one? I know both exist out there. 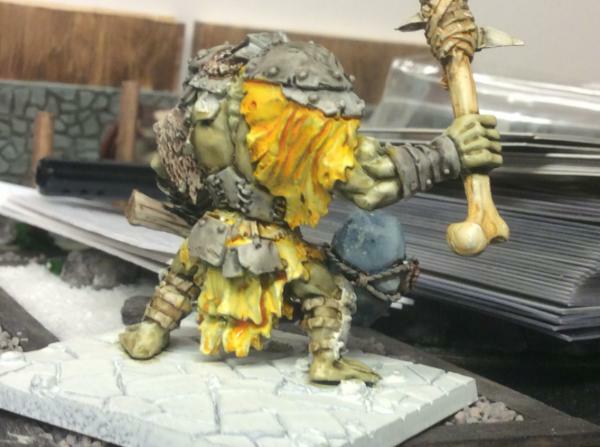 I'm liking the colors on that big ogre looking dude. What'd you wash the skin with? I'm never satisfied with orc skins colors. Been tempted by PP stuff lately, huge fan of Matt Wilson’s art, but not the models for some reason. I’ve heard stories of their plastics and resins not being great but it’s the prices and the 3rd edition being broken from the go that has kept me away. Mantic might get a reprieve from me....still debating. 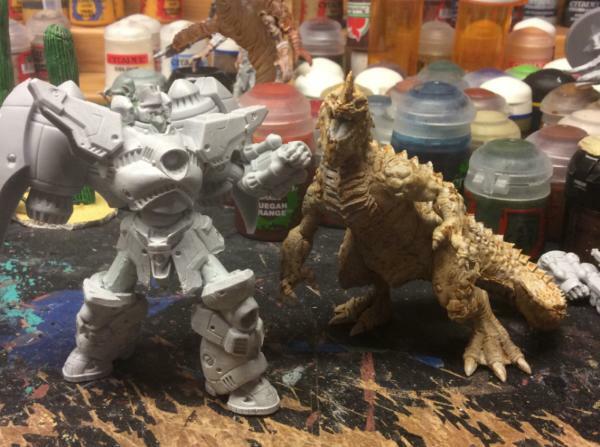 youwashock wrote: Hmmm...I am only very tangentially aware of Mantic's models. That orc looks pretty cool. Technique seems to be working out, too. Some of Mantic stuff is great, most is mediocre but there’s just too much that’s rubbish. It more of the poor business sense that ruins it for me. Tons of kickstarters and plenty of changes post Kickstarter but pre delivery. highlord tamburlaine wrote: Is that Infernal a metal or plastic one? I know both exist out there. It’s a plastic one from the Dungeon Saga Kickstarter. It’s in a red plastic if that helps. The skin color is a trick, and the main test of this model. 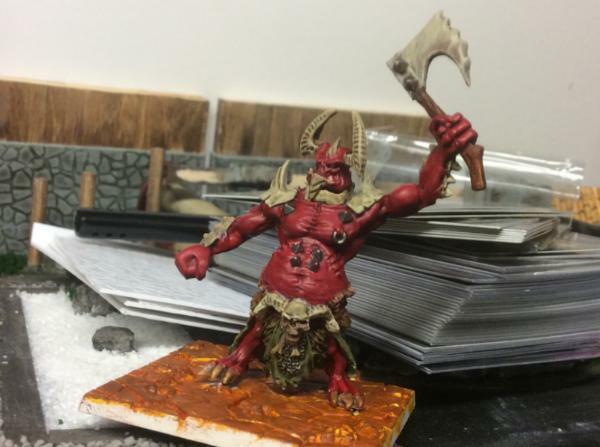 I used athonian camoshade over white. 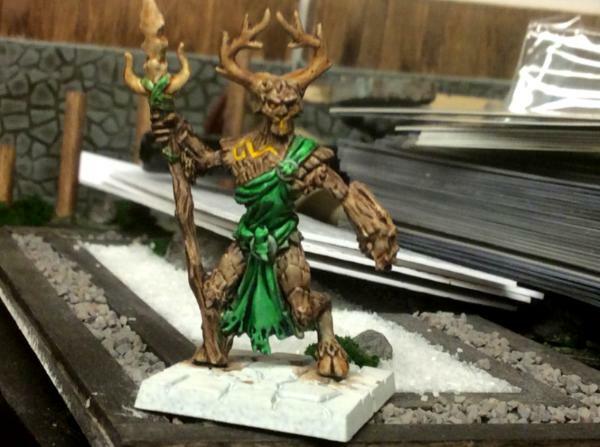 The mix of the green and the brown from the athonian camoshade does the rest. Like most of this model I have to hit it multiple times with lots of drying in between layers. This morning is seeing another layer as the washes have cleared up, but that will just add more depth in the end I hope. Edit: it’s a bit, took a shower, and did some more washes on more test models. These were figs I tried to start painting last year, but like Highlord Tamburlaine I didn’t like how the skin was going as it was a really dark green. So before I left for work yesterday I did a quick Vallejo grey 70.601 paint on prime coat and hit them with a wash. Unfortunately I didn’t let the primer dry enough sothe green came through on the cloth parts and now the yellow is a yellow and green mix . I’ll keep going on with these as they are a test and I can do the rest correctly if I like how this turns out. 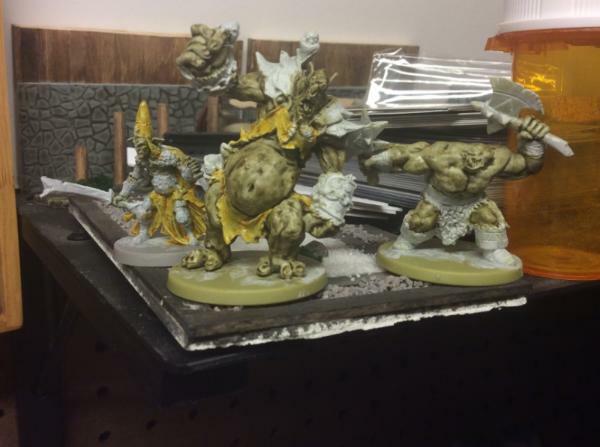 These are from CMoN game Massive Darkness, so just to see how they would look like with the Mantic guy. WHAT HAVE I DONE . Looking good so far bud. Thanks Cam, if I can’t make them good I’ll make them rediculous . They seem like just the army to do that with. Speaking of silliness, I found my copy of B-Seiged darkness and fury , another cheap buy at Miniaturemarket, I got it for less than $1 a fig, so just the right price range. Cue some test models in action. The orc berserker has a really stupid pin head (fists are twice as big as his head), and the troll sized guy has these little lizards things called Mulfins that he throws and they explode like grenades. Only one sculpt per each of these figs, but they are characterful. They are some nice models! Loads of character. You always find the most random stuff. Thanks Graven, i think they find me though . Anyway I finished this troll throwing the exploding lizard thing. I’m not going to try for cleaner cloth it didn’t look right on a test figure. Green dirty clothes FTW. Found some of my Mantic orcs....now I remember why I didn’t like them . 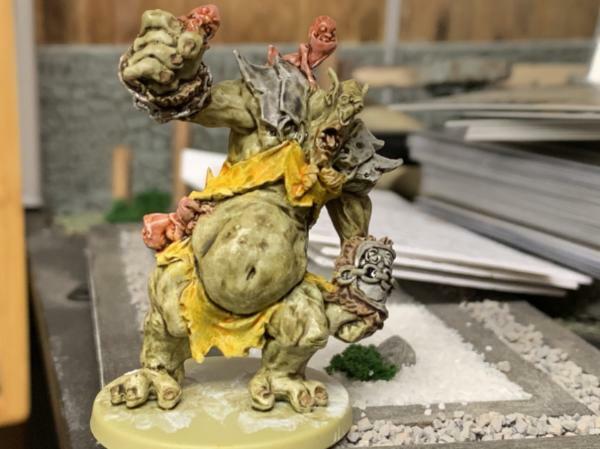 The CMoN boardgame figs are so much better quality wise. So after trying to paint a few and chucking them literally across the room (frustrated that I bothered painting them), I put the rest of them aside nicely. I did do some other painting though. 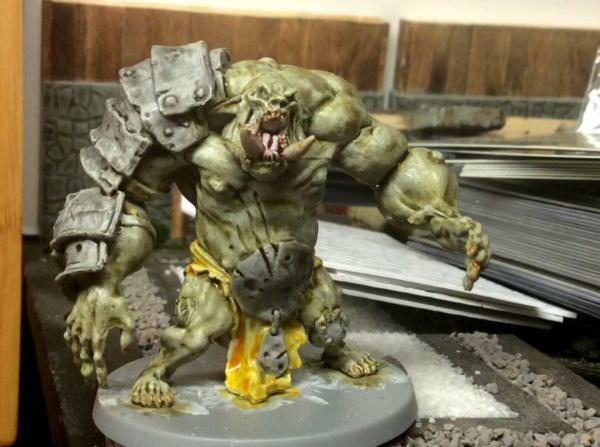 Siegebreaker ogre from green plague. Hoarde brother with comparison for size. Man I wish these were available separately and not just part of the Kickstarter pledge exclusives. Both of these just have one coat of wash on them, more to come. And backside for those wanting to check out his baddonkadonk trunk . 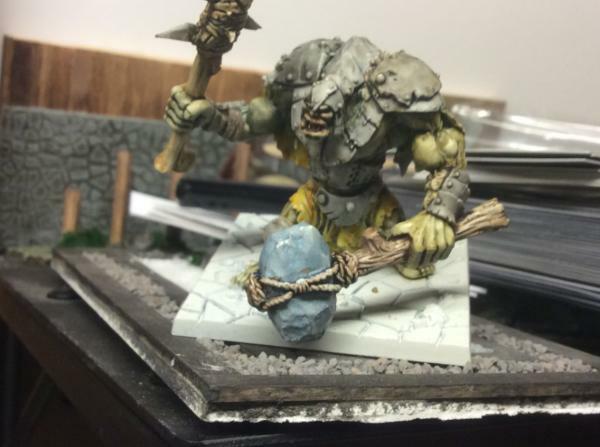 Those CMON orcs look pretty brutal. 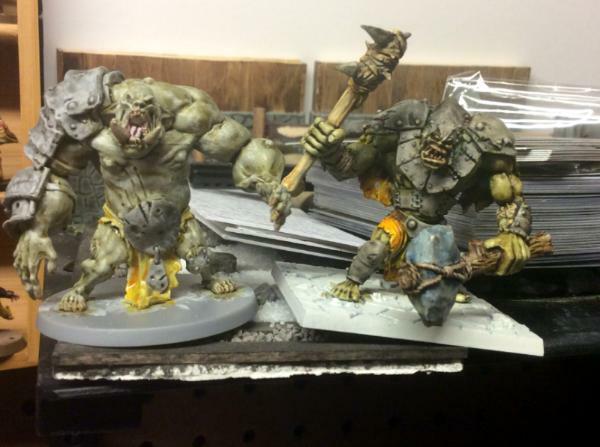 I completely glossed over the Green Plague KS. Probably because I don't like Zombicide and I am wary of things CMON is a part of. 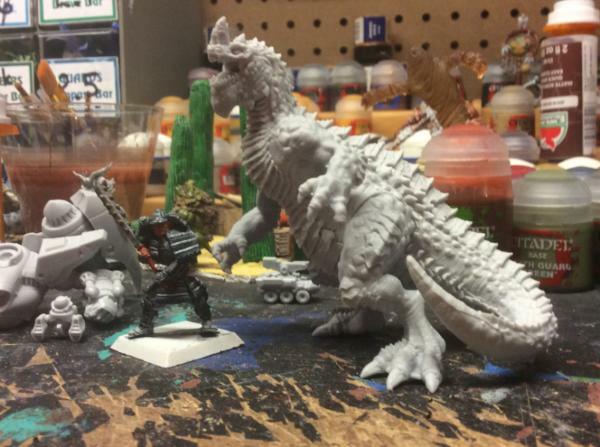 They do crank out some solid boardgame minis, though. I like that you've just decided to paint random models while you wait to be inspired. These models look fantastic. 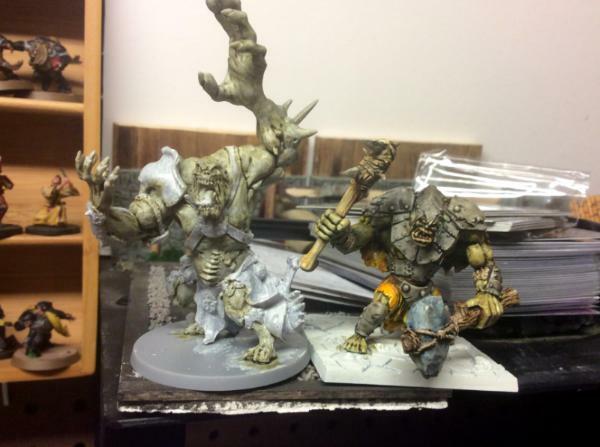 youwashock wrote: Those CMON orcs look pretty brutal. 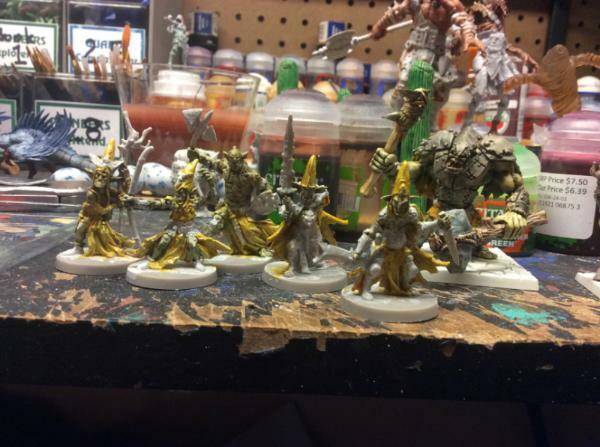 I completely glossed over the Green Plague KS. Probably because I don't like Zombicide and I am wary of things CMON is a part of. 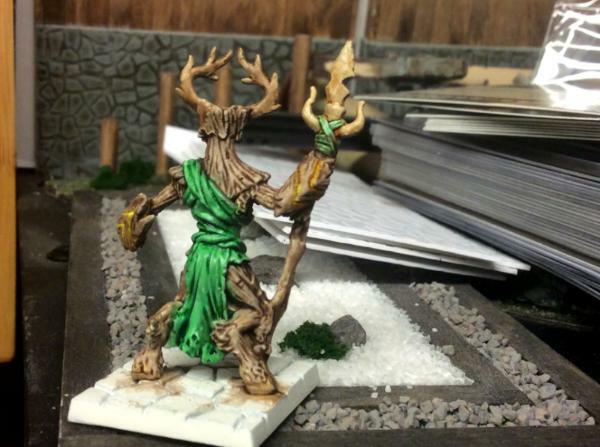 They do crank out some solid boardgame minis, though. I did too, but I barely was able to late pledge, the giants were the tipping point for me, as well as the trebuchet and ballista. Haven’t played it, just use the models.....eventually. Warboss_Waaazag wrote: I like that you've just decided to paint random models while you wait to be inspired. These models look fantastic. Random is a nice way of naming it. So I’ve been eyeballing something else not usually in my range of stuff( that means another system/range terrain ). I think this might be my first privateer press purchase ever . 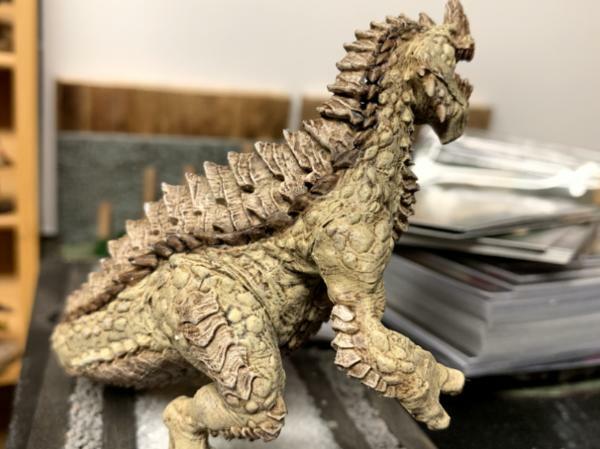 I picked up a copy of Monsterpocalypse starter set for the GUARD, and also the big Dinosaur dude TerraKahn(maybe not his actual name, I’ll doublecheck when I get home. So Theo is now doing big stupid stompy robots vs giant lower than average intelligence lizards with a superiority complex having a rumble in the Bronx. I don’t like the color choices that they used for GLTAILWSC, so that will change, more later thanks for looking. Monpoc, huh? I will eagerly be awaiting your take on the new models. They looked pretty sweet, but I have a bunch of the old stuff squirreled away and that will probably serve to keep me away from all but the most discounted buys. That and the mountain of unpainted models that threatens to entomb me daily. Bring on the stompy bots! Dr H wrote: Good work Theo'. youwashock wrote: Monpoc, huh? I will eagerly be awaiting your take on the new models. They looked pretty sweet, but I have a bunch of the old stuff squirreled away and that will probably serve to keep me away from all but the most discounted buys. That and the mountain of unpainted models that threatens to entomb me daily. Bring on the stompy bots! Well I never messed about with the old models, so my comparison will just have to be with other model ranges. They do indeed look sweet, which is why I have given in. The placement of gates and stems for the resin/plastic is not great . Big Defender X has large gates on his jets for the backpack on curved areas which look bad on close inspection, and there is some serious mold slippage happening especially on his legs and also the backpack jets. I have scrapped what I could down, but without going deeper and visibly changing a tubular structure to flat on the one side it’s just going to be visible. Terra Khan has gates on the edges of his arm and leg joints , which when trimmed off leaves some gaps, same can be said for his jaw joint. He also had a major gate on his tail which after trimming away and painting I’ll just make it look like a smaller beast chewed on him there. Details are fantastic on the models though . I will have to play around with the positioning of Defender X’s body as his backpack is really heavy and I need him to try and stand up while fighting monsters. I got the bodies primed last night and even gave Terra Khan a sepia wash just to bring out details before I begin painting. I’m off today and as wind chills are at -20* Fahrenheit (-29* Celsius) I’m trying to stay inside anyway, so might as well paint . Oh, and rocket punch to the face. That last one looks like a bro-punch. "Oh, you big kidder." *bop* . Let's go wreck downtown. Wow. Those are sizeable hunks of plastic. Looking forward to seeing how you paint Defender X. Was a fan of GUARD in the old game. Briancj wrote: That last one looks like a bro-punch. "Oh, you big kidder." *bop* . Let's go wreck downtown. youwashock wrote: Wow. Those are sizeable hunks of plastic. Looking forward to seeing how you paint Defender X. Was a fan of GUARD in the old game. Anyway, Terra Khan was my big draw, so he got the lion share of my painting time today. Really struggling not to hit him with a green glaze. 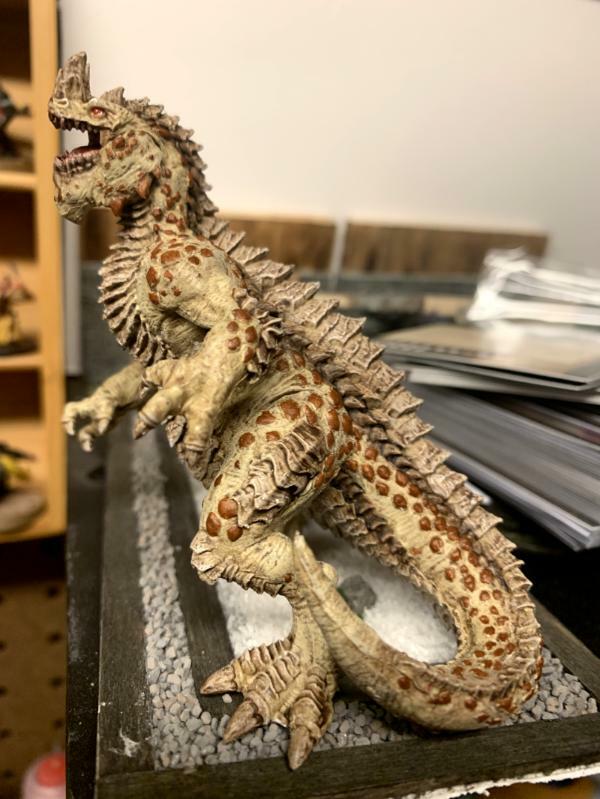 My question to you all is what should I do with his scales on his sides? Well I may have finished him off...unless you guys have some suggestions. I might give him a sepia wash on they scales, not sure though. Also missing parts have been dispatched already by Privateer Press , I’m really impressed by their speed and we will see what the follow up looks like when it arrives. 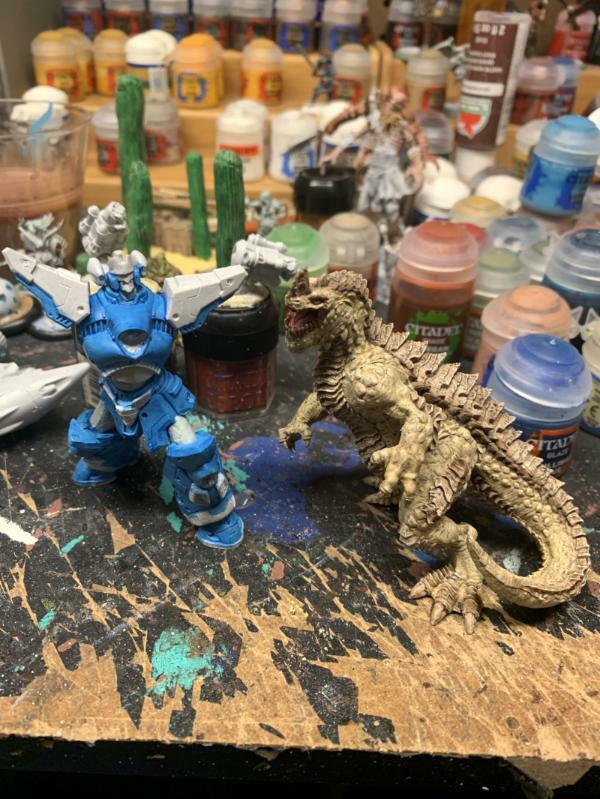 Also Defender X has been redone with Kantor Blue as the base coat for the blue, the Lothern blue was way to light even with a Guilliumanblue glaze. Kaiju tastic. Love it. Top notch, really vibrant. Rawrsome. I think a bit of wash on the scales would be a good call.